Exciting news! 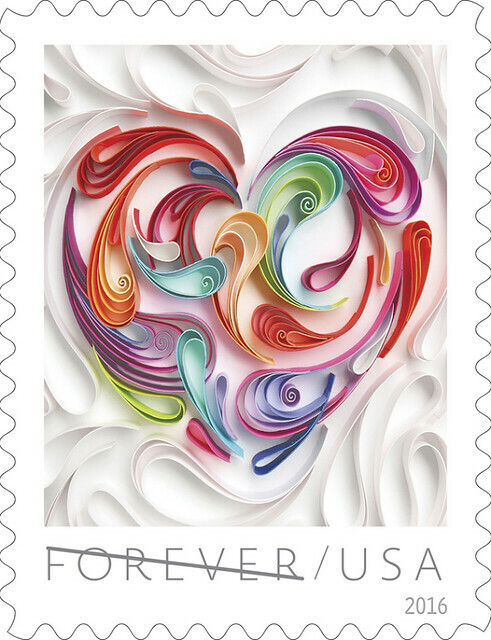 The 2016 USPS Love Stamp features a heart quilled by Yulia Brodskaya. The post office will release the Quilled Paper Heart stamp early next year in time to be applied to all those snail mail Valentines and wedding save-the-dates. To my eyes, the graceful shapes conjure up thoughts of teardrops... after all, tears of joy and sorrow are the ways of the heart. And how nice that the art of rolled paper will be introduced in such a vivid way all across the nation! A Call for Artists has been issued for a 2016 special exhibit titled Chasing Paper to take place next June in Lake Oswego, Oregon, a town close to Portland. The exhibit is open to handmade paper and paper arts including sculptural designs, papier-mâché, folding, cutting and laser cutting, excavated books, quilling, and other forms of manipulated paper. The jurors will be Helen Hiebert, a paper artist many of you may know from her weekly newsletter, The Sunday Paper, and Rita LiChen, Founder and Museum Director, Suho Memorial Paper Museum, Taipei, Taiwan. Lake Oswego Festival of the Arts (LOFOTA) is on Facebook. For those of us who are crazy about tiny houses, Carol Fisher of Holiday Spirits just released this paperboard village kit for 2015. They look so stylish as is - all dressed in white - but of course you can paint and decorate to your heart's content. 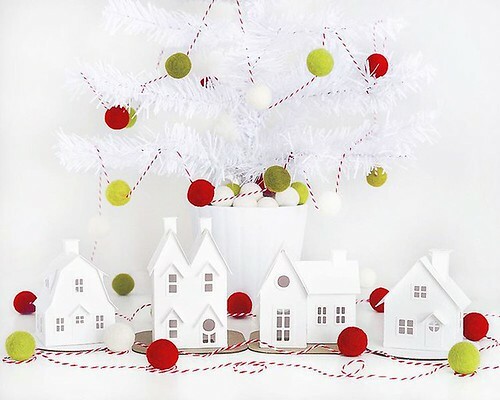 Carol shared her best tips on adding snow and glitter to paper houses in a post earlier this year... it's a great resource. Wow, what a pretty stamp. That is also a fun village with some nice detailing. Sigh, so luscious and lovely as ever! I'm jealous! I will have to petition the Canadian government to offer a quilling stamp. Thank you for the heads up on the new Love stamp! I love that quilling is getting some recognition! Two quilling articles in the newsletter this week! So exciting, congratulations to Yulia and Sarah! Here's hoping quilling is the next big thing!